Tigist Bahiru, an urban health extension professional, successfully meets with community members to determine how to best provide health care services to hard-to-reach groups in their area. 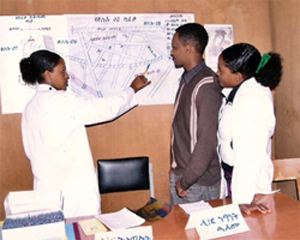 "I was happy and enthusiastic to take the job," said Tigist Bahiru, a certified nurse trained and deployed as an urban health extension professional in Debremarkos town, Amhara region, Ethiopia. "However, when I was deployed after the training, I had difficulty approaching the community, various community groups, and associations. It was not easy for me to start visiting houses without the households or broader community understanding the overall program." Bahiru is one of 3,401 urban health extension professionals working as part of a government program which aims to improve access to basic health services and address major health issues in urban areas, such as maternal and child health, HIV, food security, and poor sanitation. The organizing principle of the program is to provide "household-centered" health services which link patients back to public sector health facilities. The USAID-funded Ethiopia Urban Health Extension Program (USAID/UHEP) works to support the goals of this government program. Only 22 years old, Bahiru was tasked with collecting initial health-related information for USAID/UHEP from 500 households in her community. Yet because she was so young and not trained as a community engagement specialist, Bahiru was not taken seriously by the people she was trying to help. This lack of respect and trust seriously limited her ability to do her job. While still struggling to engage the community, Bahiru received a call inviting her to attend a meeting conducted by USAID/UHEP, for various members of the community including local leaders, youth and women associations' representatives, and health professionals. The objective of the meeting was to raise the community's awareness about urban health extension professionals and to engage them in supporting the extension professionals' work. Within a few days, many meeting participants were speaking enthusiastically with fellow community members about the importance of supporting urban health extension professionals. Indeed, when Bahiru went for her next household visits, she received warm welcomes from each household. "Community participation in planning is a key component of [my work], and I achieved that thanks to the sensitization meeting," said Bahiru.